Last summer the Costume Institute exhibition at the Metropolitan Museum of Art featured an amazing collection of clothing by Paul Poiret. I didn't know much about Poiret prior to seeing that exhibit and since I'm not very eloquent and this isn't an essay for credit I'll just say it was awesome and beautiful and I loved it. The illustrations and the colors and the silhouettes where amazing. The show made me want to go home and paint with my watercolors and drape myself in yards of silk charmeuse. My favorite part of the exhibit was this wrap dress, which has stuck in my mind ever since. I think it is because I had a "one-peice pattern" project when I was a fashion student. My dress was similar in some ways... it was a wrap with a simple front closure and pleating across the waist, but Poiret's dress is far and away better than mine.... (giggle) I think I used a plaid! There is a back and a front torso sloper in gray. The red lines represent slashing and spreading to close out the darts. The blue lines are my Poiret style lines. The dashed line across the back waist is meant to be cut and the lower back portion gathered (or pleated, I forget now - how sad) to create a bit of a bustle. The real thing was unlined silk so it had a very bohemian drape. 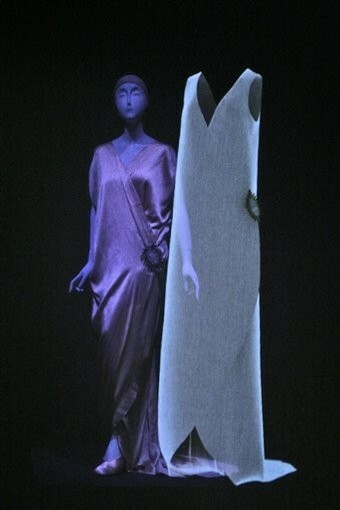 Now, Poiret didn't draft a pattern, he draped it... and voila, it was fabulous!.... but I like puzzles and if you didn't get a chance to see the exhibit's super cool hologram I think the flat pattern explains it pretty well. what does "slashing and spreading to close out the darts" mean? ood question! This was the coolest thing I learned in pattern making. Basically, it means moving the dart excess to another area to change the style. You can see that the original bodice front had a side bust dart. I wanted to move the dart excess to the armhole so I "slashed" (really it means to cut) from the mid point at the armhole (there is usually a notch on the armhole curve that I tend to use) to but NOT through the bust point. Then, I pivot that chunk of pattern on the bust point down to the left so that the bust dart is closed. "Spread" refers to adding fullness for other style features such as pleats, tucks, and gathers. There are pattern making textbooks that explain this in more detail. It's a pretty handy concept. Cool! I had to read your explanation twice before I understood, but I do get it. Thanks!